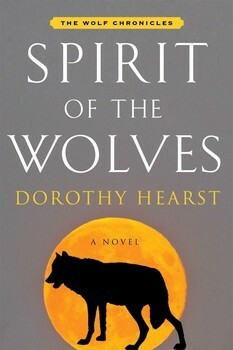 Spirit of the Wolves, by Dorothy Hearst – book review by Fred Patten. NYC, Simon & Schuster, December 2014, hardcover $26.00 (356 pages), Kindle $13.99. Spirit of the Wolves is a.k.a. The Wolf Chronicles, Book Three, following Promise of the Wolves (2008) and Secrets of the Wolves (2011). The Wolf Chronicles is the first-person story of Kaala Smallteeth, a female cub born into the Swift River wolf pack of the Wide Valley; a rich land of several wolf packs, many prey animals, and tribes of men. At this time there are also huge Greatwolves (dire wolves?) who act as guardians – and guards – of the regular wolves, making sure that the wolves obey the Promise and never consort with humans, lest they start becoming mysteriously subservient to man (which presumably means evolving into domesticated dogs). Kaala is the stereotypical Young Rebel. She Asks Questions instead of Accepting. Who created the Promise? Why can’t wolves associate with humans as equal partners instead of as servants? Why are the humans being taught that wolves are their enemy, and they must dominate the wolves? The first two novels are full of unanswered questions, unless you consider “How dare you question your Elders?” to be a satisfactory answer. Kaala doesn’t. Finally frustrated beyond endurance, she takes matters into her own paws and breaks several taboos, which get her and a tiny band of followers like wolves Ázzuen and Maara, and young humans TaLa and BreLan, exiled together. It is hard to summarize the first two Books without giving away spoilers, but as Spirit of the Wolves begins, Kaala has learned that the Promise they have been taught is a fraud and the opposite of the true Promise. The Swift River pack must not only consort with the humans, it must protect them while preventing them from destroying nature. The wolves must also leave the Wide Valley to prevent a human-wolf mass slaughter, caused by the villainous human DavRian who has convinced his human tribe that all wolves are vicious and must be killed – while consorting with the humans. But the Swift River pack does not believe her. Ruuqo, Rissa, and the other wolves continue to trust in the false Promise to protect them. To complicate matters, the Greatwolves themselves are divided into two factions, and it looks like the one that wants to kill Kaala is about to seize power. “‘I’m going to find my mother –‘ I began. The Greatwolves give Kaala only until Even Night, less than a month away, to leave the Wide Valley, find her mother, and get the answer to the Promise. Milsindra and her human-hating faction are openly sure that Kaala will fail and that they can take over the Greatwolves’ council and start a war to exterminate the humans; while Kaala and her pawful of followers can be sure that Milsindra’s faction of Greatwolves will not wait until Even Night to try to sabotage them. “It was like no human dwelling I’d ever seen. The humans of Kaar are about to decide whether to live in partnership with the wolves, or to kill them all. Can Kaala’s influence make a difference? And this is less than halfway through the novel. What adventures lie ahead? The humans of today do not live in equality with wolves. Wolves have evolved, or degenerated, into pet dogs. So how can Kaala succeed? How can Spirit of the Wolves possibly have a happy ending? A few of these definitions increase the exoticism nicely, but their pedantic profusion constantly interrupts and slows the flow of the story. Tlitoo’s mate is Jlela. She also quorks. Spirit of the Wolves’ irritants almost improve the story. They make reading through it to find out what happens to Kaala more compelling. If you have read the first two novels of this trilogy, don’t stop now. If you haven’t, start at the beginning, with Promise of the Wolves. This is “literature”, so you should be able to read it for free at your public library.